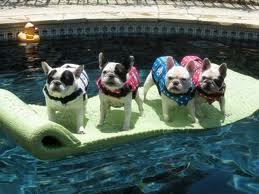 If you decide to take your Frenchie to the beach, pool, or lake it is a good idea that he have a dog life vest. Like people, dogs can tire in the water, or panic if they fall in unexpectedly. Most Frenchies cannot swim, some do, but all Frenchies must wear a life vest. For ultimate safety on the water, a dog life vest is a must-have accessory. Choosing a dog life vest doesn’t have to be complicated. This guide will help you choose the one that’s right for your favorite pooch. First and foremost, will the dog life vest support your dog? Check the buoyancy standard of each dog life vest you consider, and be sure your dog falls within that range. Your dog doesn’t care about material, color or style, but you should. Choose a dog life vest that’s made from sturdy nylon and/or neoprene. These materials are strong, long-lasting and easy to clean. Color is critical. A dog life vest not only keeps your dog afloat, but should be easy to spot at a distance, against a variety of backgrounds. Choose a color that pops. Reflective strips on a life vest add to visibility, and safety. And speaking of safety, if you choose to remove your dog’s collar while he or she is swimming, make sure the life vest will accommodate a waterproof ID tag. While every dog life vest is adjustable for size, choose one that’s suited for the size of your dog. Always take your dog with you when shopping for a dog life vest, and have your dog try it on. A dog life vest should adjust to fit snugly, without impeding your pet’s ability to move its legs. Heavy-duty, quick-release straps and buckles will keep your dog in the dog life vest, and make it make it easy to get the vest on and off. Finally, be sure the dog life vest you choose has a strap or handle on the back, to make it easy to assist your canine companion out of the water. A dog life vest you can throw in the washer beats one you have to hand wash, so check the care labels carefully. Like your car’s seat belts, a dog life vest should fasten snugly and easily. Tug on each dog life vest your dog tries on, to make sure it’s secure. If there’s a way to get out, your dog will find it. And be certain there are no extra rings, dangling straps, or decorative features that could get caught on underwater obstacles. A dog life vest not only provides protection for your dog, it provides peace of mind for you. For boating, rafting, or other water sports, a dog life vest can make a lifetime of difference for your dog. Hello, I have a cobby, broad chested, (near perfect to standard) Frenchie. Looks like your cream Frenchie, 2nd from right in the picture. What brand and size is it wearing? My Frenchie is 22lbs bulk. What brands do you recommend for Frenchies?